New Networks and our new addition, the IRREGULATORS, are an independent, expert team comprised of senior telecom experts, analysts, forensic auditors, and lawyers who are former senior staffers from the FCC, state advocate and Attorneys General Office lawyers, as well as former telco consultants. New Networks is independently funded through research and consulting, forensic communications auditing and other projects as well as the sales of books and research reports. It is Time to Take the FCC to Court. The FCC has been captured by AT&T et al. From the recent decision to get rid of Net Neutrality, to the FCC’s attack on privacy, or helping the companies shut off the copper networks and force rural areas or inner cities on slow and expensive wireless, we call this collection of regulatory mayhem “The Wheel of Misfortune”. We are part of an appeal of an FCC decision on Business Data Services, our data has been used in an investigation of Verizon New York, currently leading to settlement-mode, and we just uncovered an major, structural flaw in all FCC proceeding. Help us take the FCC to court. New Report: Solving Net Neutrality: We Found a Fatal Structural Flaw in Every FCC Proceeding”. We believe this can be used to take the FCC to court in the Net Neutrality decision and other proceedings. This FCC is out of control and has been captured by AT&T, Verizon and the cable companies. And we need to take them on– now, before it gets worse. We have found a serious flaw in the FCC’s current decision on Net Neutrality and want to take them to court– and the clock is ticking. AT&T, Verizon, Centurylink and the cable companies, are now some of the most hated companies in America. — If you like them — don’t give us money. 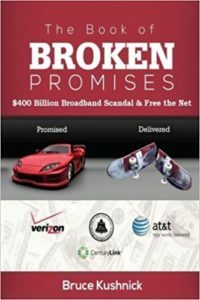 Bruce Kushnick even wrote the book on ‘broken promises’ and the telco rip-offs. He does this for revenge for his Aunt Ethel. They are going to raise you rates, not upgrade their networks, keep competitors off the network and they’ll be no regulators to keep them in check; and the plan is to move everyone to more expensive wireless at home. We’re for Open, Fast affordable networks for everyone –So if you’re for slow, expensive, closed networks where they control who gets it — don’t donate. Place a bet– and let’s see how far we can take this.